Is there a common way of settlement? As a basic principle, the Romans settled in cramped surroundings in hamlets and villages. The Germanic tribes prefer a loose way of settlements with scattered buildings. Where this was not possible due to avalanches, mud flows or mountain torrents, the Walser built closed settlements. This tendency is found with the southern Walser, in Rheinwald, in Vals and Avers. The other Walser settlement areas are all with scattered buildings. Each family built on its land living and farm house, stables and barns. Over the centuries, many of the high-lying farms are no longer used all-season but as huts or “Maisäße” (only used over summer). The people moved near the churches (e.g. Nufenen in Rheinwald). The village’s centeres also built up because of the strongly growing population and infrastructural necessities. 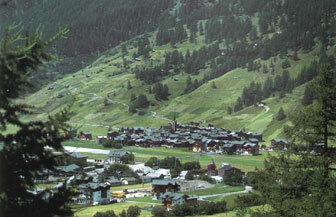 In Valais, so called “Haufendörfer” (built-up areas) are typical. Here, it is not the landscape demanding such type of settlement but rather the ancient working conditions. Both settlements with scattered buildings and closed ones are equally common with the Walser. Both also appear in other alpine regions. However, the scattered buildings with seperated residential and farm building- in contrast to the Alemannic single building- are connected with the eastern parts of Graubünden, Liechtenstein and Vorarblerg.